Are you looking for a meditative pasttime that is productive as well as relaxing? Have you alway wanted to create unique and beautiful yarns? Well then, learning how to spin yarn on a drop spindle might be just the thing for you. Spinning is simple, but it takes focus and practice to learn. 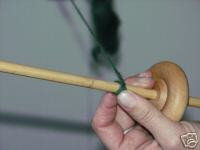 Anyone can learn how to spin beautiful yarn using a simple, inexpensive drop spindle. You don’t need a spinning wheel to learn to spin yarn. 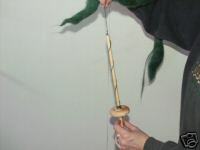 In fact, it is easier to learn how to spin on a drop spindle. Then when you are thoroughly addicted to spinning – you can upgrade to a wheel! To get started, you need some fiber. This can be fluff from your dog, wool from the neighbor’s sheep, some roving you bought on ebay or alpaca from the new critters in your barn. 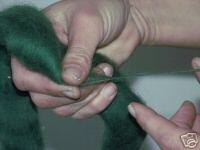 It is easiest to learn on fibers that are about 3 inches in length. Wool is the easiest to learn on. It is relatively inexpensive, the fibers are a good length to create yarn and wool fibers have little barbs on them, so they want to stick together. 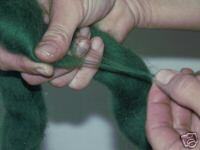 Roving is fibers that have been cleaned and carded, so that they all run the same direction. this makes it much easier to learn to spin. Do a search for wool roving on ebay, you will find lots of colors and types. If you have fiber of your own, such as alpaca, dog (known as cheingora) or llama you can use it to start, as long as the staple length (the length of the individual fibers) is about 3 inches long. Shorter or longer fibers are more of a challenge to work with. It helps to card it before spinning it so that the fibers will flow smoothly past each other, without snarling. Drop spindles are readily available on ebay, also. Look for one that looks straight, solid and not too light or too heavy. A 1.5 to 2.5 ounce spindle seems to be easiest for beginners to start on. It is heavy enough to maintain spin, but light enough that the yarn does not break. Whether you want a top whorl or a bottom whorl is a matter of personal preference. I find that top whorls are easier for people who are going to be spinning standing up and bottom whorls are better for people who will be spinning sitting down. The basic spinning process is the same for both. Before you start spinning, become familiar with the roving. Pull some of it out of the rope like length. See how the fibers slid past each other. Pull off a strip, about as thick as a pencil and about as long as your arm. Twist it between your fingers. See how it makes yarn! 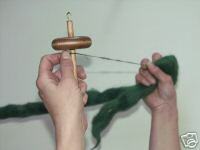 Now, with one hand, take your drop spindle and push the hook on the end of the spindle through a few fibers of the roving while you hold the roving in the other hand. Pick up about as much as you are going to want your yarn to be thick. With your fingers, twist the spindle and pull down slowly, allowing the fiber to feed out from the roving and twist into yarn. Hold the roving softly, allowing it to flow out of your hand as you spin. When you have finger twisted about 2 feet of yarn this way, take it off the hook and wind it around the spindle. The wind on process is slightly different for a top whorl or a bottom whorl. With a top whorl, wind the yarn on to the shaft below the whorl, bring your yarn over the whorl and twist it twice around the hook. 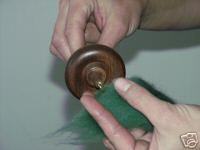 With a bottom whorl spindle, wind your yarn on top of the whorl and twist it around the shaft and up to the hook and then twice around the hook. Now, if you need to, finger spin about another foot of yarn, feeding the fiber out of the roving. When you have about a foot of yarn between your roving hand and the hook on the spindle, pinch the roving between your thumb and forefinger and do not allow it to feed out. With your other thumb and middle finger, give your spindle a twist. (If you have thumb problems, you can spin your spindle by rolling it on your thigh. 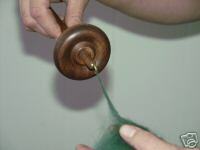 Thigh spinning is much easier to do with a top whorl spindle.) you want to build up a lot of twist in your yarn. When you have a lot of twist built up in your yarn, park your spindle by tucking it under your arm or between your knees. This will keep it stable while you draft out your fibers. 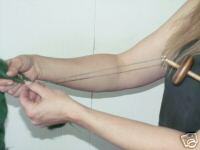 Move your spindle hand up to where your other thumb and forefinger have your yarn pinched and hold the pinch. Now with your roving hand, loosen up the fibers and spread them out into a triangle. Now pinch with your roving hand and then let go with your spindle hand. Watch the twist climb the fiber and make yarn. You’re a spinner! 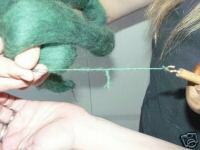 Now keep inching the twist up the yarn, letting it run between the two pinches formed by your thumbs and forefingers. This is easier than it sounds, don’t get frustrated, just give it a try. Don’t let any twist get up into your roving, if it does, you won’t be able to draft. If you roving gets twisted, take a break and untwist it. As you gain experience, you will be able to leave out the Park step. Some people always spin park and draft, though. I spoke to a woman the other day who spins with the park and draft method and is spinning yarns and then knitting blankets for the troops overseas with her yarn. Other people find they love spinning but want to be able to make yarn faster. This is when you want to look into getting a spinning wheel. Having learned the basics of drafting on the spindle will make the transition to the wheel much easier. Look for upcoming guides on choosing a wheel and beginning to spin on a spinning wheel. If you have any questions, feel free to contact me, jenonthefarm. The art of spinning fibers into yarn is as old as civilization. In today’s world, spinning is a craft that not only lets you make wonderful and unique yarns, it also ties you to the past and gives you a way to unwind and relax from the stress of daily life.